Spring has sprung, which means a change from less active, hibernating winter days to more active, over-scheduled days of outside fun. Slow paced days nestled inside with a good book or family board game are set aside for sports practices and games, dance recitals and end of the school year programs. It is during this time of year that I rely more and more on healthy and delicious meals that I can get on the table as quickly as possible. Instead of making a trip through the local drive-through, I often turn to my favorite fast food to solve my time crunch dilemma… shrimp. Shrimp is one of those ideal foods: kid friendly, quick and easy to cook, and versatile with so many recipe possibilities! Shrimp can be served over pasta, grilled on kabobs, placed inside a tortilla for a seafood taco and served over greens like the recipe I am sharing below. 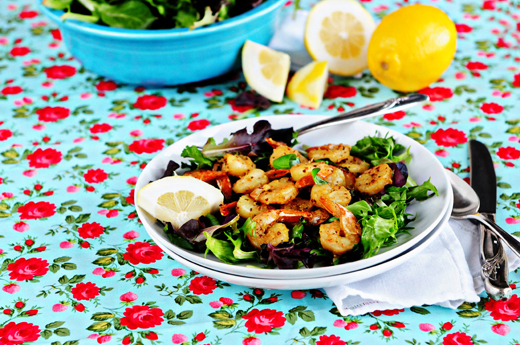 The best part about cooking with shrimp is that most of the time it can be fully cooked in 10 minutes or less! I don’t know about you, but quick meals using shrimp are certainly a schedule saver on busy, spring nights. I hope utilizing shrimp in your evening meals helps you to skip the drive-thru and allows you to carve out time to savor dinner as a family during this busy time of year. In a plastic container, combine olive oil, Dijon mustard, garlic, lemon juice, lemon zest, pepper, salt and red pepper flakes. Whisk to combine. Add the shrimp and toss well to combine. Cover the container and put in the fridge. Let the shrimp marinate for up to 4 hours. Heat an outdoor grill to medium high. Add the shrimp in batches, cooking on each side for about 2 minutes, or until the shrimp is just cooked through. Do not overcook. Transfer shrimp to plated salad greens. Serve with lemon wedges. I love shrimp! I think shrimp scampi is probably my favorite. But, I also like it grilled with olive oil/salt/cayenne pepper and put over salad. I think I might have to go out and get some today, my mouth is watering! Shrimp scampi is my favorite too… soo good! I agree… shrimp can be such a simple and easy dinner. Love this post from Kristen. Shrimp is pretty awesome. And yes, it is fast food!! Love this salad. So. Much. Usually I make shrimp with garlic and oil over pasta. I like the how spicy this recipe is… it sounds like the flavor could really hold up in a taco or mixed salad. That’s what I love about shrimp… the possibilities are endless! This looks delicious. I am adding it to my menu for next week right now. Yummy! 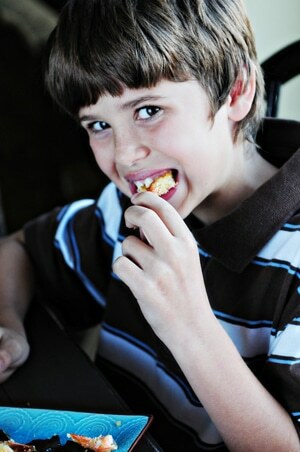 My kids gobbled it up – I’m sure yours will too! Enjoy! I adore shrimp, but typically only eat it when we go out because a certain someone in this household won’t eat seafood unless it’s battered and deep fried. But I think this recipe just might be flavorful enough for him to consider it. I’ll pick some up when I go to the market today. And thanks so much for the Shrimp Taco link love! Man, those tacos really were good. I’ll have to make them again. Don’t know when it happened! But my crazy picky eater is now into shrimp! We try to give it to him 2 times per week. Love this recipe and will try to vary his shrimp eating habits. Anything with butter! I love shrimp scampi sauteed and then added to a pasta. I love shrimps and I think I can make one this weekend..I am so excited now! Thank you for sharing the recipe I want to try this kind of food I love sea foods..Thanks for sharing.. In a large pot with a lid, mix 12 oz. water or beer and 2 T. Old Bay seasoning Bring to a boil. Add 1-5 lbs. shrimp with their shells on. Cover and steam five minutes. Uncover and check shrimp. If they are all pink and curled, they are done. If not, give a quick stir, cover, and cook for another minute or two. Drain shrimp and chill well before serving. They are great as a casual appetizer with cocktail sauce (mix ketchup or chili sauce with prepared horseradish) or as a topper for a main dish salad. I try to eat a shrimp but i fond out I have a allergy eating it.